About six months ago one of “the dads” invited me over to his monthly poker evening. For those who are young and innocent, by “the dads” I refer to a group of middle-aged men who have next to nothing in common with each other than the fact that their children have at some point befriended one another, usually at school, although in this case some of our kids go way back to nursery. Anyway, before the first night I had never played poker before. My strategy was simple – to have a few drinks and enjoy myself. It was fun, but much more tiring that I had realised – we finished at about 2am, by which time I was utterly exhausted. 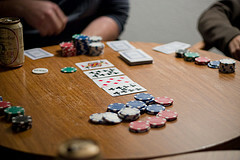 I cannot remember much about my first night, but in the second and third months I started to get the hang of the game and on both evenings I was “chip leader” for a while, with a massive stack of counters in front of me. It felt good to be winning. However, each night I would eventually crumble and lose everything. Seeing the other guys take home a chunk of the winnings – the top three shared the cash, with the winner taking 50% of the pot – made me want to get a little more out of the evening than purely the chance to socialise. So, after the third month (I do like to take my time) I decided to do some research. I search the Internet for poker advice and tips, and there is a heck of a lot. I watched YouTube videos on how to win at poker (there are some really good ones, like the Lag Donkey Poker Videos, and a lot of really, really terrible ones too!). Poker is largely about probabilities combined with bluffing. I tend to do well with the probabilities, it seems, but terribly with the bluffing. I usually lose my chips to a bluff, or get eager and think I can bluff and then bet on crap cards. Beer does not help. Anyhow, on the fourth month I did better again, and managed to finish in a very respectable joint third place, which meant that I went home with my initial “buy in”. I did not win any money, but I did not lose either. But that is not good enough! So, to get myself ready for the fifth month I decided to practice playing online. I searched for a nice poker room and settled on Mansioncasino.com. They have several video poker games with free practice. These, I felt, were not a touch on playing for real, but they helped me to better learn which hands are good to try a bluff with, i.e. raise when I do not have much to play with! Anyway, once I started to feel braver still, I decided it was time to enter the realms of the Live Poker rooms. Playing for real money is a bit scary, and I will be honest, the experience cost me a little in the pocket. But, I did learn to play a better game. In the last two poker nights I have come second, much to the chagrin of the other dad’s who thought I was going to be the easy one to beat each month! I have not yet let on that I have been playing poker online to improve my game. I might tell the host next time, if I do well again! So this is how you are doing so well – I knew you were up to something!